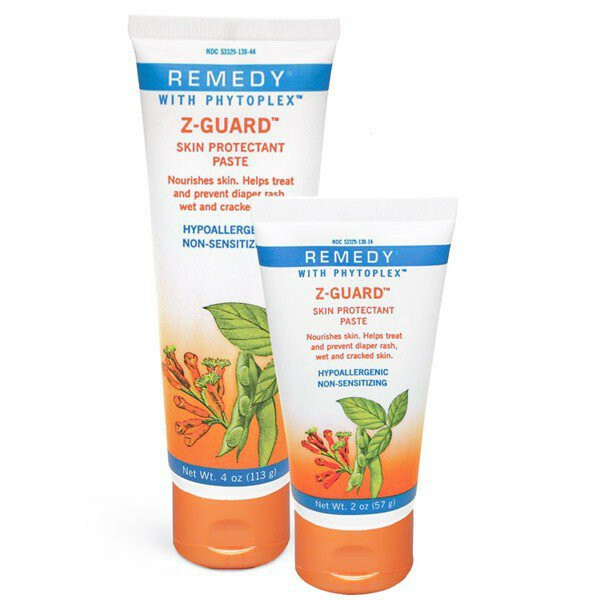 Medline Remedy Phytoplex Z-Guard Skin Protectant Paste by Medline is a paste used in the relief of discomfort associated with diaper rash caused by wetness, urine, and/or stool. 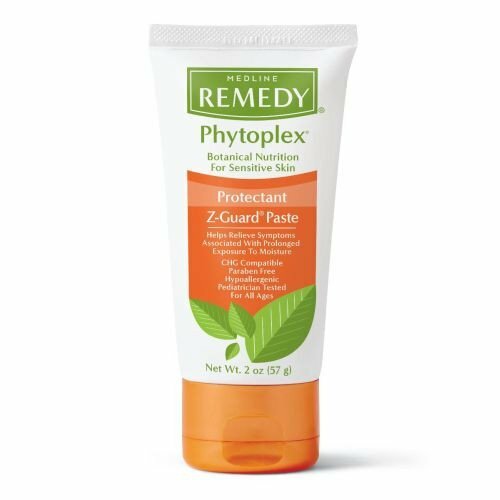 Phytoplex Z-Guard Ointment is also useful for treating other macerated skin conditions. It is a white, petrolatum-based formulation sticks on irritated or denuded skin. 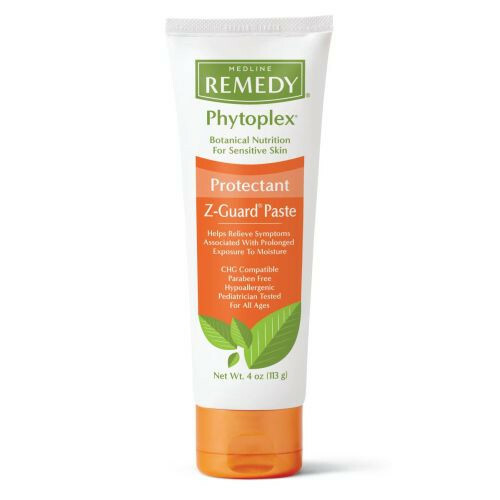 The Z-Guard Paste is enhanced with zinc oxide, allantoin, natural oils and Phytoplex. The Phytoplex system, which also acts as the enhanced ingredient, helps mitigate negative effects of redness and dry skin by maintaining conditions for normal skin function. The Phytoplex in the skin paste also helps nourish, moisturize and soothe the skin. This protectant cream is formulated without menthol or other analgesics that may cause burning on sensitive skin. Remedy Z-Guard temporarily protects and helps relieve chapped and cracked skin. This product also protects minor cuts, scrapes and burns. Remedy Phytoplex Z-Guard Cream is ideal for use in neonates, geriatrics, oncology patients or anyone else with macerated skin. It's latex compatible, and it is latex free. It is available in 2 oz, 4 oz, and .13 oz tubes (57 ml, 113 ml, and 4 ml respectively). Used in relief of discomfort from diaper rash caused by wetness, urine and/or stool. Sticks on intact, irritated or denuded skin. Phytoplex helps mitigate negative effects of redness, dry skin; helps nourish, moisturize, soothe skin. Formulated without menthol or other analgesics that may cause burning on sensitive skin. Temporarily protects, helps relieve chapped and cracked skin. Protects minor cuts, scrapes and burns. Ideal for use in neonates, geriatrics and for oncology patients. Does the Phytoplex skin protectant paste have an expiration date or they don't expire? Expiration date is approximately 1 year from the date of purchase, according to the manufacturer. Phytoplex skin paste reduces the redness in in my skin and helps my dry skin feel so much better. It is soothing relief from my skin itchiness.